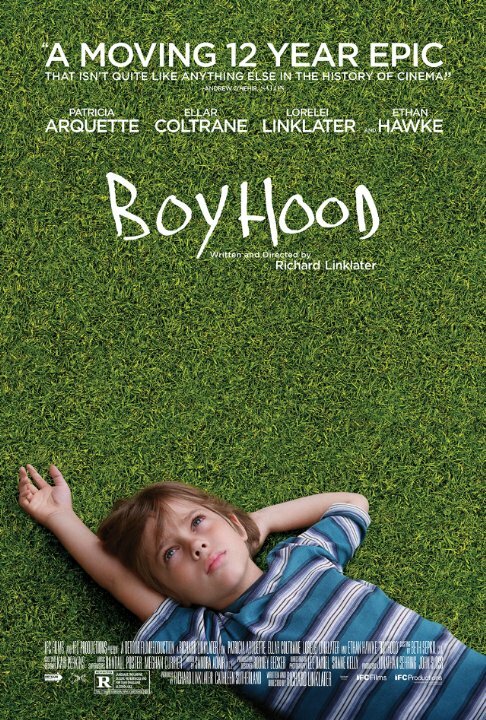 Boyhood (2014): Written and directed by Richard Linklater. Starring: Ellar Coltrane, Patricia Arquette, Ethan Hawke, and Lorelei Linklater. Rated R for language including sexual references, and for teen drug and alcohol use. Running time: 165 minutes. Some films are built upon gimmicks. Such films are usually content to rest upon them, while great films transcend gimmickry to a point where the gimmick evaporates. Needless to say, Boyhood falls into the latter camp. It’s the result of a 12 year experiment by Linklater, a director known for his improvisatory, dialogue-heavy films. Segments were filmed using the same major actors, culminating in a 12-year odyssey that follows Mason (and the actor, Ellar Coltrane) from child to adult. Linklater doesn’t stagger the journey; the transition between ages is so subtle and seamless, you’re amazed that Mason could possibly be off to college when we just saw his mother reading to him in bed. At 165 minutes, the time flies like the years in a life. There’s no conventional plot to speak of, or even a consistent dramatic arc. We know at the beginning that Mason’s parents are divorced, with the mother assuming primary care and the father assuming the role of “weekend dad.” Yet Linklater achieves the best possible balance with this story—he never forces the drama, while subtly conveying the emergence of a soul. The film play like a series of memories: never abstract, but never fully concrete. What else can’t be pinned down? The tone. You might as well try to define the experience of growing up. Heartbreak and loss give way to joy and wonder. Much is lost, as families are moved, created, torn apart. Linklater doesn’t skimp on tragedy here—when things get bad, they hit you right in the gut. One moment Mason and his siblings are riding their bikes like the children of summer, the next they come across their mother crawling away from a drunk husband. Yet this is a life complete, not a traditional narrative. Revelation and joy do come, but they’re often obscured. Mason’s father can offer sage advice, borne out of genuine love—but it’s tempered by his lack of involvement in his son’s life. Mason must constantly sift through multiple (often didactic) voices. A lesser film may have been content with its premise when it came to characters, or at least settled for sterotypes. Yet the players remain grounded, even the ones that flit in and out of Mason’s life. This extends from Mason’s mother (Patricia Arquette, inarguably her career best performance) to his sister (Lorelei Linklater) to his semi-present father (Ethan Hawke). They’re performed and written so well, Linklater could easily have centered the film upon any one of them. The eponymous “boy” could have been a cipher, or a silent watching persona, but Linklater and Coltrane make him specific, intelligent, uncertain, flawed. He finds a passion for photography, wears earrings (and occasionally nail polish), and waxes philosophical about humanity’s relationship with technology. It’s a specific kind of acting, one grounded in naturalism and humility. The film wouldn’t have worked without this character being utterly compelling. Coltrane nails it. But those are hallmarks of Linklater’s style, surely; what about the criticism levied against his allegedly bland visual style? Here, Linklater shows a great eye for frame composition. He turns a hiking excursion between Mason and his father into an intimate arboretum. Or creates a palpable sense of danger in a half-finished house, where boredom gives ways to contests of machismo. These visual tricks don’t loudly announce themselves; they add color and dimension to a world that doesn’t ask you to do anything except experience it. Like his Before films, Linklater has created an oxymoron: the intimate epic. There are no easy answers, few resolutions, and far too many loose ends. Like Mason, we need to find the moments that matter—and realize we’ll only partially succeed.